Update XP drivers for your Brother printer and fax. DriverXP For Brother can help relieve you of worries about installing out-of-date drivers. 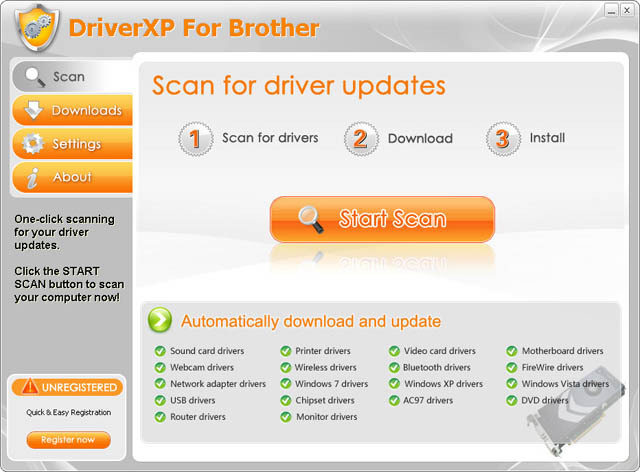 It scans your system and install Brother official drivers for your Brother devices automatically.Its amazing success at bringing thousands of users drivers for their Brother hardware is why DriverXP is guaranteed to find the right driver for your system. Download and bring your Brother device back to life. Update XP drivers for your Brother devices such as Brother printer&fax. ...... Unfortunately, finding the right driver for your hardware can be time-consuming and error-prone. Did you lose the driver disc that came with your Brother hardware? Is your Brother device not listed anywhere on the Internet? Are you struggling to find the drivers that will get your Brother hardware working with your version of Windows? You're not alone! Finding the correct official Brother driver for your hardware can be a tedious task - especially if you accidentally install the wrong driver and damage your computer. DriverXP For Brother takes the guesswork out of it by automatically downloading the correct drivers for your Brother hardware. DriverXP For Brother has a 100% success rate identifying all Brother hardware manufactured since 1996. The results from its in-depth scan of your system are compared to DriverXP's massive driver database, giving you the best possible driver for your hardware. Jonas Brothers Free Screensaver. Photos slideshow. Qweas is providing links to DriverXP For Brother 3.1 as a courtesy, and makes no representations regarding DriverXP For Brother or any other applications or any information related thereto. Any questions, complaints or claims regarding this application DriverXP For Brother 3.1 must be directed to the appropriate software vendor. You may click the publisher link of DriverXP For Brother on the top of this page to get more details about the vendor.